As we race towards an automated world there can be a tendency to think that all problems can be solved with technology. A computer program or app or online service can solve it all, can create for us, can make it easier, can make it cheaper. Without a doubt, there is truth in this, but many times we can be trading off quality for convenience, and if you are in the business of creating and selling new products then accepting this trade-off canÂ end your project before you even really get started. When it comes to a one-off Prototype orÂ Trade Show samples that are not created from full production tooling or processes, it is often the surface finishing of the part/product that can make or break your project. That fine detail in the corners, on the edges, in the hidden recesses of your part/product, that when done right can be the difference betweenÂ winning or losing an order. Don’t take your idea to the market or to investors meetings with a part/product that is half finished for the sake of convenience. You really need the finished article to make an impression, at least as close to the finished article as you can get. Hand Finished, first class Prototypes with exceptional surface finishing that onlyÂ an experienced craftsmanÂ can deliver will give you the complete visual and tactile presentation that can help take your project to the next level. At HLH, we use a lot of technology, that is the world we live in, we utilize it to ours and our customers advantage. But we never forget our roots founded in handcrafting and Hand Finishing parts/products. 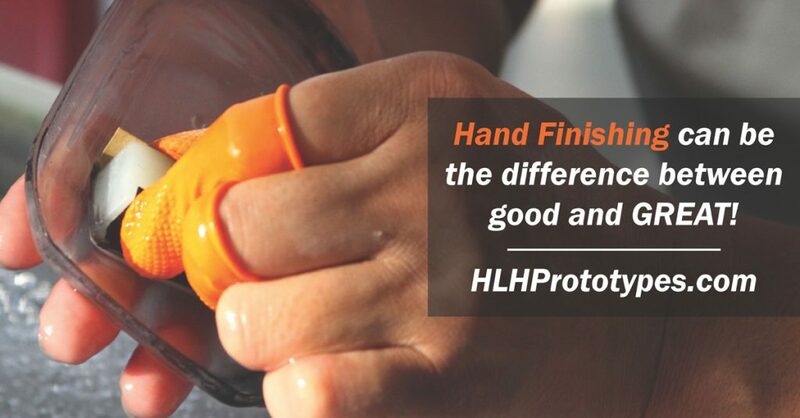 Sometimes only a Hand Finished part/product will do, It can be the difference between good and great.